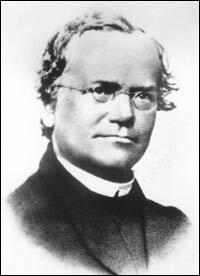 We blogged about Gregor Mendel's insights in a recent post, and we mentioned various questions about what he did and what he thought he did and wanted to do. There is no question, however, that his work was used to produce one of the most powerful research methods in the history of science. Combined with the methodology that resulted from Darwin's ideas (that is, the understanding that life has diverged from common ancestry, and the traits that have evolved had to be viable in their respective environments), biology made great progress in understanding development and evolution. The so-called 'Modern Synthesis' of the 1930s and 40s united patterns of inheritance with understanding of how inherited variation accumulated over time in diverging species, making a consistent underlying framework for understanding much of the nature of life. The result today can be called the 'Darwinian' method (we blogged about this earlier in a series of posts starting here). However, Mendel's work also led to the often unstated expectation of clear-cut 'phenogenetic' connections--that is, between genes and traits. More specifically, his work led to the idea that genes 'cause' traits and that natural selection only works on genetic effects. That's because non-inherited effects, which certainly do exist, disappear with the individuals bearing them,while genetic effects are 'written' in genetic posterity until modified by further genetic change. This is over-simplified, but still a powerful and valid way to view life. But the truth is that phenogenetic connections are not all that precise. When traits are controlled by many genes, each varying in a population, then each individual with the 'same' trait may have it for different genetic reasons. The expectation of strong phenogenetic connections is the problem limiting GWAS and other genome-based attempts to explain, much less to predict, disease or other traits. Overall, the problem can be seen in the common confusing of inheritance of genes, which does happen, with the inheritance of traits which doesn't (except for those present in a fertilized seed or egg). Traits arise from genes, at least in part, and may resemble those in ancestors, but it is inaccurate if not misleading to think of traits as inherited directly. Seen another way, when traits are the result of many different contributing genes that can each vary, as is so common, then even the same trait in an offspring and its parent (e.g., how tall they are), are affected by genes but are not due to the same genotype. There are many traits in which variation really is largely due to single genes, but these are the luscious hooks that have addicted us to Mendelian principles when they don't really apply. Furthermore, from an evolutionary viewpoint, genetic (reproductive) success is a relative concept among individuals in a population, and hence does not lie in genes alone, but in the environment in which they find themselves, and that is always changeable. Even the future genetic environment is not entirely predictable, nor are the non-genetic aspects of environment (like our lifestyles). Also, Mendel's rules are about the transmission of elements--genetic variants--from parent to offspring when the parents are dipoid, that is, when there is sexual reproduction and each of two parents carries two copies of each gene. Bacteria and many other species (which means most species!) are haploid (only one copy of their genome) and don't transmit in a Mendelian way which is to choose between two copies. This is what got Mendel into trouble when he began to experiment with hawkweed. This means that the Modern synthesis was about diploid evolution, not evolution per se. The evolutionary principles don't require Mendelian 'laws'. This shows, in perhaps another way, that what Mendel did was provide a method for understanding variable transmission, that was used to discover what genes are and where they are in cells. These issues make practical differences in science. Today, GWAS and direct genome sequence comparisons used to look for causal genetic variation (say, of diabetes or autism) compare individuals sampled not from families as was necessary before we could really identify specific gene sequences, but sampled by their trait (cases vs controls, for example), with the genes searched directly to find variation preferentially associated with some specific trait value. We can see this in the fact that new mutations arise all the time, that may have causal effect but were not transmitted from the person's parents. In a sense, the properly lauded Modern Synthesis arose by the rejection of Mendelian causation, in the sense that clear-cut trait-inheritance was not required either for biological traits or for their evolution, if genetic variants, no matter how small or even statistically undetectable their effects, was transmitted in Mendelian fashion. Rejecting the idea that traits were largely inherited as distinct effects made things consistent with gradual evolution of complex traits, and that made the synthesis possible. But mixing Mendelian genetic transmission principles with genetic causal principles has led, we think, to expecting too much of specific genes.